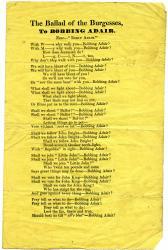 [ Printed handbill poem addressed to John Bright of the Anti-Corn Law League, MP for Birmingham. ] Celebration Ode: on the Occasion of the Bright Celebration, by Alfred Capel Shaw. 4pp., 12mo. Bifolium on pink paper. In fair condition, lightly-aged, with minor evidence of removal from stub. A poem of 13 irregular stanzas. Begins: 'When some great warrior returns | Triumphant to his native land, | The heart of all the nation burns | To welcome him. [Female suffrage; printed pamphlet.] Speech of Jacob Bright, Esq., M.P. on the Electoral Disabilities of Women Delivered in Edinburgh January 17, 1870. Printed by Spottiswoode & Co., New-street Square, London. 1870. 12pp., 12mo. In good condition, lightly-aged, no wraps, disbound. Two copies on COPAC and two copies on OCLC WorldCat. [Female suffrage; printed pamphlet.] The Debate in the House of Commons on the Women's Disabilities Bill, on May 3rd, 1871. 43pp., 8vo. In good condition, lightly-aged, no wraps, disbound. Includes speeches by Jacob Bright, Eastwick, Bouverie, Scourfield, Lord John Manners, Beresford Hope, Lyon Playfair, James, W. Hunt, The only copy traced (other than surrogates) at the University of London. No other copy currently on the market. [Female suffrage; printed pamphlet.] Married Women's Property Committee. Report of the Proceedings at the General Meeting, held at the Rooms of the Social Science Association, 1, Adam Street, Adelphi, London, On the 28th July, 1876. [Married Women's Property Committee.] Manchester: Alex. Ireland and Co., Printers, Pall Mall. 1876. 15 + pp., 8vo. In good condition, lightly-aged, no wraps, disbound. Includes speeches by Jacob Bright, Peter A. Taylor, Mr Arnold, John Hinde Palmer, H. N. Mozley, Miss Downing, Mrs A. Arnold, Mrs Venturi. No copy found on either COPAC or OCLC WorldCat. [Female suffrage; printed pamphlet.] Report of a Meeting in St. James' Hall, on Saturday, March 25th, 1871, for the London National Women's Suffrage Society. 15pp., 8vo. Drophead title. In fair condition, lightly-aged and worn, no wraps, disbound, with outer leaves separating. Reports of speeches by Bright, Playfair, Leslie, Fawcett, Howell, Taylor and Herbert. Two copies on COPAC and three copies on OCLC WorldCat. [Henry Clifford, telegraph engineer.] Two Autograph Letters Signed (one 'H. C.' and the other 'H. Clifford'), written in a playful style to his daughter 'Elsie'. One of the letters partly in verse form, with caricatures. One letter addressed from 1 Lansdowne Place, Blackheath; 6 April 1892. The without place or date. Clifford was introduced to the laying of Atlantic telegraph cables by Sir Charles Bright, whose wife was his cousin. He served as an engineer on all the Atlantic cable expeditions from 1857 to 1866, designing the paying-out machinery used on the Great Eastern in 1865 and 1866. He worked at Greenwich as chief engineer for the Telegraph Construction and Maintenance Company until his retirement in 1894. ONE: From Blackheath; 6 April 1892. 4pp., 12mo. Bifolium. Signed 'H. Clifford.' In good condition, on lightly-aged paper. Cuba Villa, Bickerton Road, Highgate, N. 6 March 1882. 2pp., 12mo. Bifolium.Good, on lightly-aged paper. In stamped envelope, with London and Blackburn postmarks, addressed by Smith to 'J. T. Baron, Esq. / 18, Griffin Street, / Witton, / Blackburn.' He is only able to reply to Baron's not now, having been 'ill & confined to bed'. He thanks him 'for the kind expressions you use respecting my Life of Gladstone, which I am glad you like so much. I suppose you are aware that I have recently published (through Messrs. Hodder & Stoughton) a companion work, the Life of Mr.
29 February 1880; on letterhead of The College, Brighton. 12mo, 2 pp. Ten lines. Text clear and complete. Good, on lightly-aged paper. 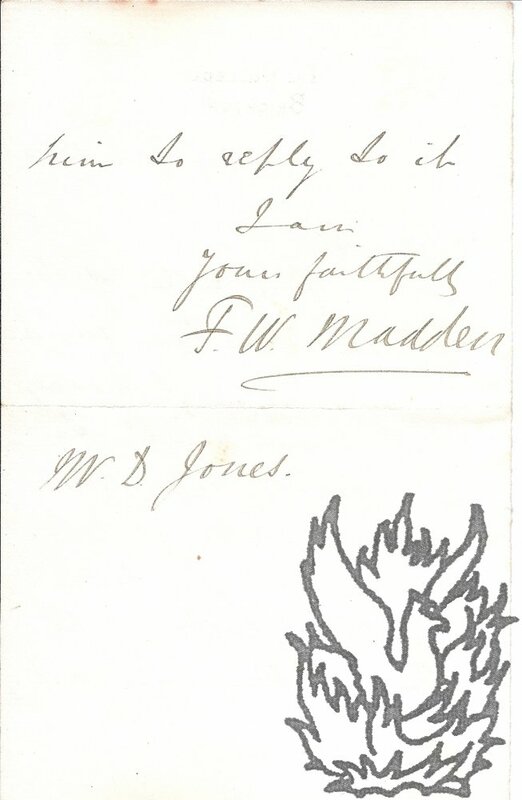 Jones's letter has been forwarded to him, but he cannot give him 'the information you are seeking', so he has sent to letter on to 'Mr. of the British Museum, asking him to reply to it'. 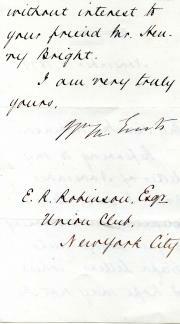 Manuscript Letter, in a secretarial hand, signed by Evarts ('Wm M. Evarts'), to E. R. Robinson of the Union Club, New York City. 12 November 1879; on letterhead of the Department of State, Washington. 12mo, 2 pp. Bifolium. Very good, on lightly-aged paper. He is sending 'some autograph letters, which I hope may not be without interest to your friend Mr. Henry Bright'. Bright, Hawthorne's closest English friend, toured America in 1852. 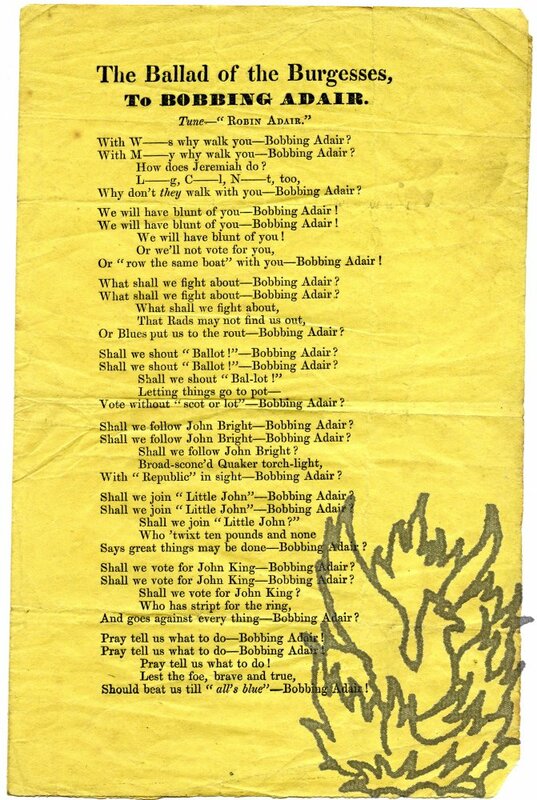 Printed handbill featuring a letter from Stapleton 'To the Right Honourable John Bright.' On the subject of the disestablishment of the Church of Ireland. 4to, 4 pp. Bifolium. Text clear and complete. Good, on lightly-aged paper, with slight chipping at head and tail. Praises the 'good feeling manifested' in Bright's 'eloquent and powerful oration' on the Church of Ireland. He is sending him 'a short unpublished pamphlet on Ireland', 'The Origin of Fenianism'. 'I am an old man, I believe older than you are. I have watched the affairs of Ireland for the last fifty years with an affection and interest which cannot be surpassed. 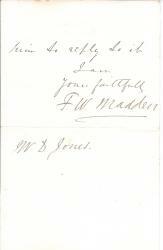 Autograph Letter Signed to "Mr Callender". Knowl Hill, Berkshire, 6 Feb. 1874. Miscellaneous Writer (see Dictionary of National Biography). Two pages, 12mo, faint foxing, other minor defects, but mainly good condition and text clear. "Allow me to congratulate you & the Conservatives of Manchester on your great triumph - a double victory, since it not only brings you into the House, but keeps Jacob Bright out!"